Recognized for his strong blocking ability in college, McClain was chosen by the Ravens in the fourth round of the 2007 NFL draft. He showed promise as a rookie, although rarely touching the ball (8 rushing attempts for 18 yards, 9 catches for 55 yards and a TD). He saw more action in ’08, often used as a tailback in combination with RB Willis McGahee and rookie RB Ray Rice due to his punishing running style. Ravens went 11-5 to finish second in the AFC North while leading the conference in rushing yards (2376) and qualified for a Wild Card spot in the postseason. Won AFC Wild Card playoff over Miami Dolphins (27-0) and AFC Divisional playoff over Tennessee Titans (13-10). Lost AFC Championship to Pittsburgh Steelers (23-14). McClain never again carried more than 46 times in a season as he returned to a primarily blocking role in 2009. Still, he received second-team All-NFL recognition from the Associated Press and Pro Football Focus and was named to the Pro Bowl again. After one more year with Baltimore in 2010, McClain signed with Kansas City in 2011 and moved on to the San Diego Chargers in 2012 and ’13, his last two seasons, where he was still an effective lead blocker but rarely touched the ball and saw scant action. Overall, McClain rushed for 1310 yards and caught 94 passes for another 557 yards, scoring a total of 16 touchdowns. 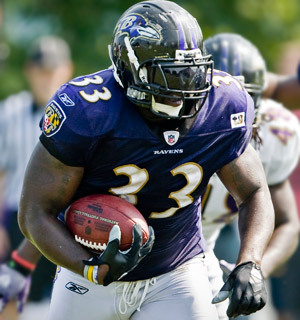 Most of his production came with the Ravens, amounting to 1185 yards on 314 carries (3.8 avg.) and 70 pass receptions for 453 yards, with 14 total TDs. He was a first-team All-NFL selection once and was twice chosen to the Pro Bowl.